Update: I did a review of this book in another post. And now for some extremely relevant advertizing. The book I want to read. Matz, creator of the Ruby language. Jeremy Ashkenas, who created CoffeeScript after reading the book, and using some of the bundled code (and who earlier created (J)Ruby-Processing, as well as an awesome demo app I ripped off). 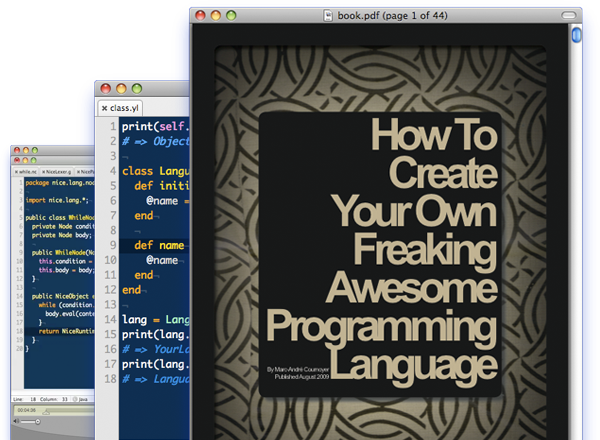 The book will guide you through the creation of a simple language written in Ruby. Once you’ve been through the exercises in the book and feel ready to dive in and create a real language, you’ll start from the template language running on the JVM (Java Virtual Machine) included with the system. And just to make sure you’re ready to use the template right away, we’re also including a screencast explaining the code.